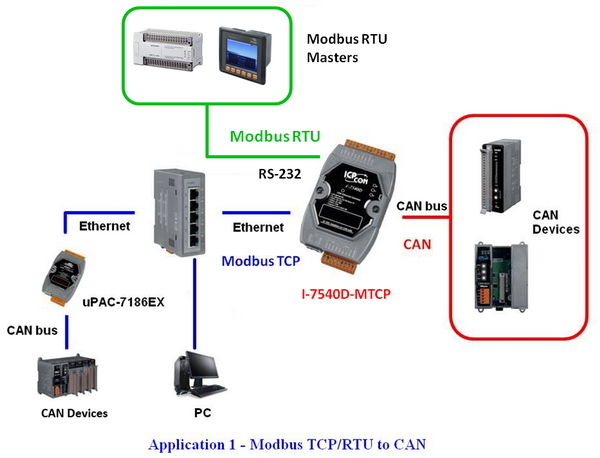 CAN to Ethernet / Modbus TCP / Modbus RTU Converter. Supports operating temperatures between -25 to 75°C. 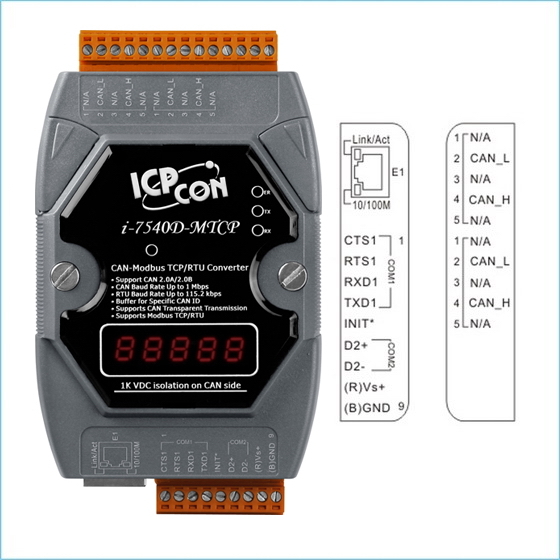 I-7540D-MTCP is a CAN to Ethernet / Modbus TCP / Modbus RTU Converter. 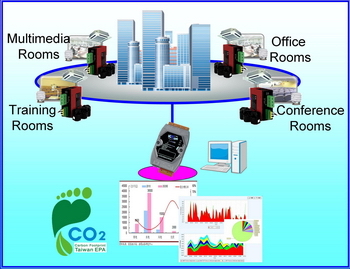 It is helpful for exchanging data between Modbus devices and CAN devices. I-7540D-MTCP is a Modbus TCP server and acts as slave device in Modbus RTU networks. It supports four communication modes: Modbus TCP, Modbus RTU, CAN-Ethernet Conversion and Pair connection. 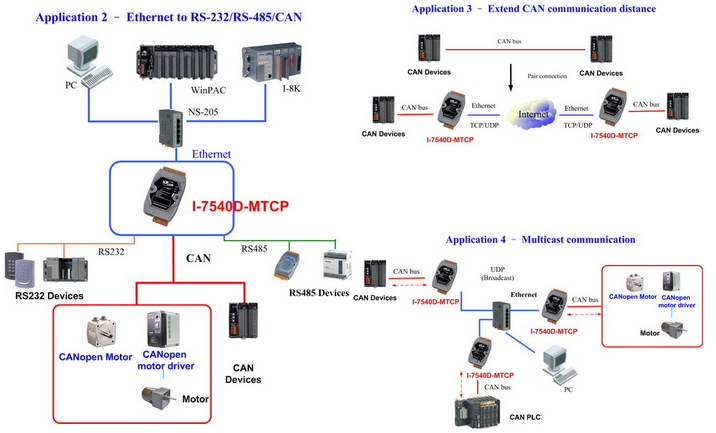 The major function of the I-7540D-MTCP is a CAN to Modbus TCP/RTU gateway. It allows Modbus TCP/RTU devices to communicate with CAN devices on a CAN network. 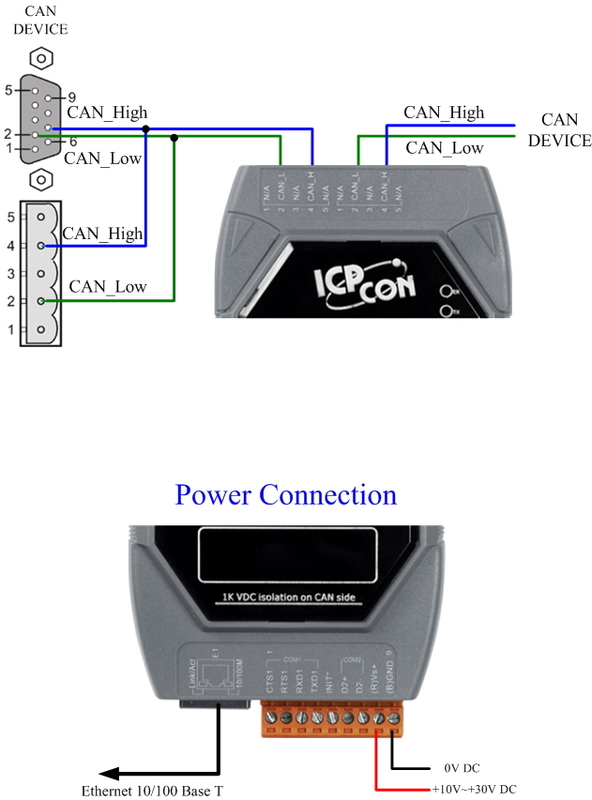 I-7540D-MTCP supports the function codes 0x03/0x04/0x10 of Modbus TCP/RTU for reading and writing of CAN messages. The device supports a transparent, protocol-independent transfer of the CAN messages, thus allowing its implementation into a wide range of possible applications. The CAN-Modbus Converter can be used with various higher layer CAN protocols (e.g. CANopen, DeviceNet or other proprietary protocols). These application diagrams show the application architecture for the I-7540D CAN-Modbus Converter. The PM-213x-CAN series power meter provides the CAN bus interface for users to easily gather the real-time power consumption information in their CAN applications. The PM-213x-CAN provides the Auto-Response mode which responses messages at regular intervals automatically. It makes the communication more efficient when collecting a lot of remote power information. The polling mode offers the precise information of every step required by the monitors. In addition, the PM-213x-CAN also owns the arbitration mechanism which can avoid data collision and error detection.